On Saturday, the 13th of October 1877, a Chicago newspaper reported on a number of court cases, including a couple that caught the eye of reader Linda Vert when she came across the notice. 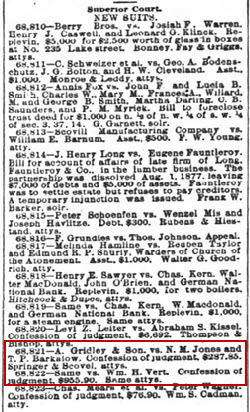 Linda knew the case meant William H. Vert was going to end up paying A. Gridley & Son the sum of $955.90… but why? What exactly was a “confession of judgment”? And where would the records be? Good questions! Particularly since the confession of judgment is a rare beast in individual consumer transactions these days, it’s not something most of us would have come across. So… how does this work? And if it’s all to avoid litigation or legal proceedings, why is this still in court? Once the debtor fell behind, the creditor could then take that confession, file it in court, and get the court to proceed directly to enter judgment against the debtor. The creditor didn’t have to file a lawsuit where he’d have to prove that the debtor owed the money; the debtor didn’t have to be given a chance to defend by saying he didn’t really owe the money. In some states, the debtor didn’t even have to be told the creditor was going to court. All of that was bypassed. Think of this as the “go directly to jail, do not pass go” card for a business deal. You may also come across a form of this confession under the name cognovit or cognovit actionem: “A defendant’s written confession of an action brought against him, to which he has no available defense. It is usually upon condition that he shall be allowed a certain time for the payment of the debt or damages, and costs. It is supposed to be given in court, and it impliedly authorizes the plaintiff’s attorney to sign judgment and issue execution.”5 The difference between the two is that the confession of judgment is signed by the debtor to be submitted to the court; the cognovit is usually a document by the debtor authorizing the judgment to be signed by the creditor’s attorney. In either case, the reason why this still went to court, since the creditor didn’t have to prove his case, was that the creditor still wanted the court to enter judgment against the debtor: the legal order of the court fixing the amount owed, with interest, and usually with court costs and even attorneys’ fees. So yes, Linda is absolutely right: William Vert was going to have to pay up. But where would the records be? We sure want them in these cases, because there’s a good chance that one of the papers filed in a confession of judgment case was actually signed by the debtor: likely our ancestor. Go get ’em… these should be interesting records! Thanks Judy, once again you’ve explained and taught us at the same time. I have the research request form all filled and ready to mail. Looking forward to finding the answers. Sure hope they have the original case file for you, Linda!